Try as I might I just can’t get into silent films. I find them overly theatrical and obvious. I get the different style of story-telling and the differences in pace when compared to modern film but I think my biggest problem is attention span. I find silent films demand so much more of my attention and I don’t have very much to offer. I groaned as I fired up my film today and spied its two and a quarter hour length. I was in for a slog. When I say I don’t like silent films, try not to judge me too harshly. 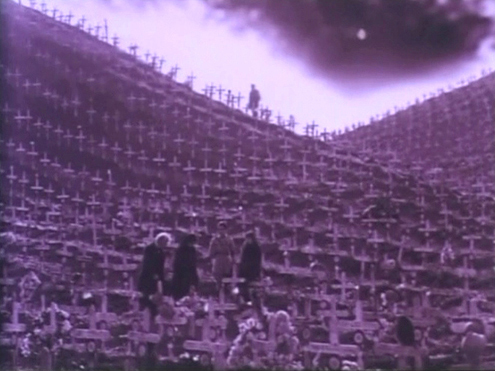 I have liked some, ‘J’accuse’ (1916) being the best for me but I also liked ‘Wings’ for its easy viewing style. And I have tried, honestly I have. Maybe I’m just watching the wrong ones. ‘Civilization’ was hard going and so was ‘The Big Parade’. There’s more on the list so I’d better get used to them I suppose. My film today is a book to film transfer and one of the biggest films of the silent era. 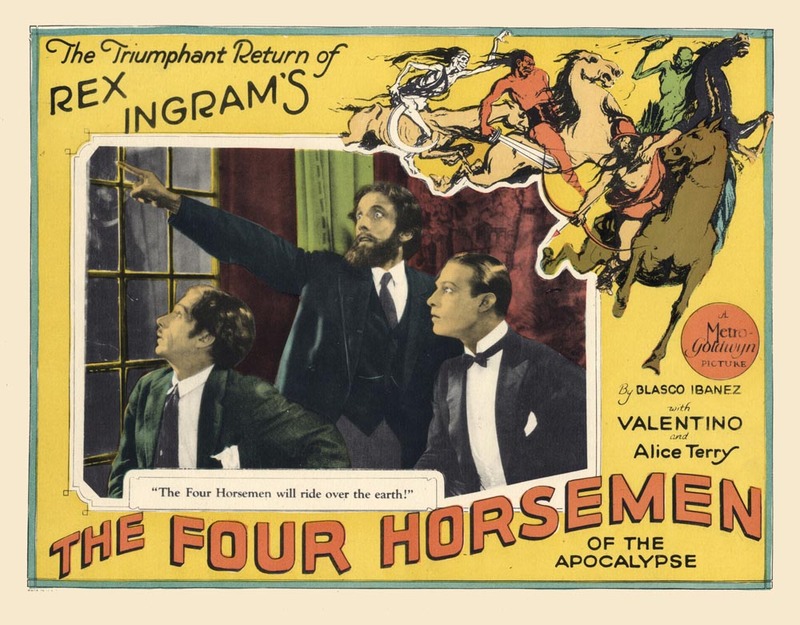 The first stat worthy of note about ‘The Four Horsemen of the Apocalypse’, and one that I think shows it’s importance at the time of its release, is that it’s the 6th highest grossing film of the silent era. Basically it was important, big and well regarded. 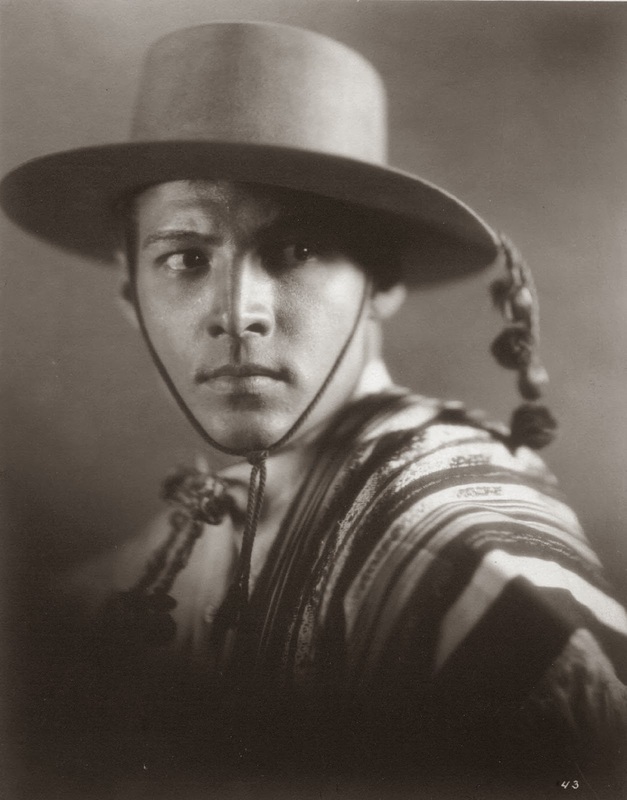 It stars Rudolph Valentino in his breakout performance and is considered one of the classics of the era. Great news! So why did I struggle with it so much? The film opens with some religiousy stuff, piously worded intertitles in a classical font. It feels old and slightly goth. The story is a simple enough tale. A rich Argentinian landowner has French and German son in laws. He likes the French guy but not the nasty old German with his bristly moustache and rounded spectacles. Valentino turns up and does a dance scene that stands out like a sore thumb and then things of absolutely no import happen for what feel like ages. Then the war kicks off. There’s the problem for me. Large tracts of the film have already gone by and I have nothing worthy of note to comment on. 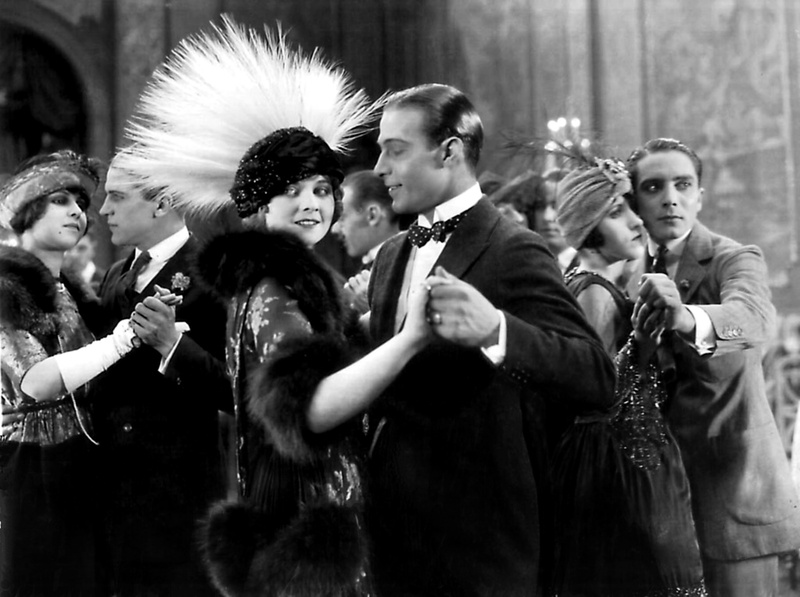 The dance scene caused a stir at the time by all accounts and created a fad for dancing the tango. Sadly it has nothing to do with the film, it was just included to showcase Rudolph’s dancing skills! When stuff does happen it’s all as overly theatrical as I expected and I face palm and count down the remaining seconds. There’s war stuff, of course, and this is where the Four Horsemen play there part. Basically, they’re used as a metaphor for the War. They gallop across the sky in a halfway decent effect on a few occasions and are used to make the point that war is bad. 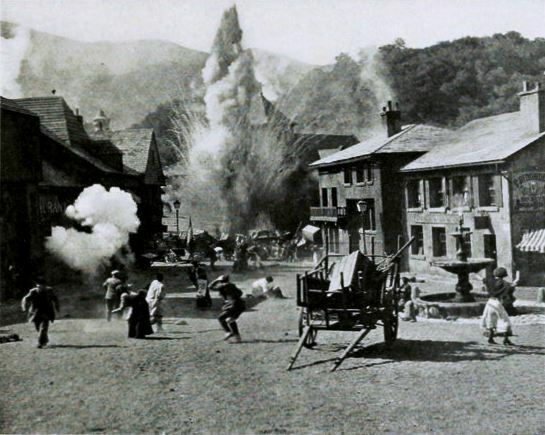 This is an anti-war film almost in the style of ‘J’accuse’ (1919) I suppose but without the overt shock and awe that Abel Gance threw at the celluloid. About three quarters of the way through I added a brief note on my phone that simply said ‘The Germans don’t come across well’. I know this film was shot from the Allied perspective by an Irishman in America a few years after the war but still, the stereotypes of German goose-stepping pomp are really on the nose. And then the Americans arrive and everyone breathes a sigh of relief as the war ends within seconds. So is it any good? Probably, it’s just I can’t get into these silent epics. I found it overly theatrical, obvious, sparse and slow. There were occasional bits that stood out for me as interesting but for the most part it failed to inspire. If I want to spend two and a half hours watching an overtly anti-war Great War Film made in the years directly after the conflict then my first choice will still be ‘J’accuse’ (1919). Clicky Clicky to get a copy. You might not regret it.